A Shakespearean relic. Or not. 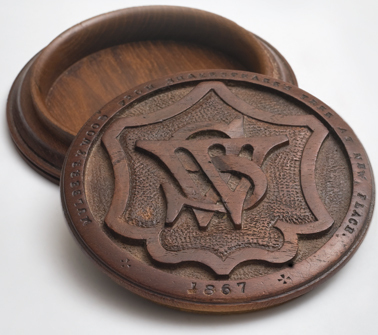 The inscription carved around the rim of this snuffbox reads, “Mulberrywood from Shakespeare’s tree at New Place 1867.” New Place, long destroyed by then, was the fine home in Stratford-upon-Avon that Shakespeare bought with his earnings in the London theater business, and to which he retired in about 1610. Tradition said he had planted the mulberry tree in the yard with his own hands. But is the wood really from New Place? Inside the box, which is about three and a half inches across, a handwritten note by the maker declares that he bought “wood from the Old Tree at New Place” on April 30, 1867, from the acting trustee of the Shakespeare birthplace estate. Stephen Parks, librarian of the Elizabethan Club, which owns the box, would like to believe him. But, Parks cautions, “there’s no DNA, so there’s no proof.” Since the tree was cut down in 1756, and the lucrative tourist trade in snuffboxes and other wooden trinkets sprang up soon after, it’s highly unlikely there was any genuine New Place wood left by 1867.